Why are crew members aboard aircraft carriers always cleaning and painting? What does it mean to “fly the ball?” The lingo and daily activities aboard an aircraft carrier can seem odd to the uninitiated. To get a better understanding of these idiosyncrasies, we need to delve into some history and key elements of life aboard aircraft carriers. The modern-day aircraft carrier can be traced back to the USS Lexington, a battlecruiser that was named after the first battle of the Revolutionary War. The USS Lexington was reconfigured in 1925 with the Navy adding a flat top (or flight deck) to accommodate aircraft take offs and landings. Unfortunately, it was sunk in the 1942 Battle of the Coral Sea and a replacement, to be named the Cabot, was built the next year. The name change was met with such an uproar that the Navy reverted back to using the original name. During World War II, aircraft carriers had straight decks, which meant that pilots who were committed to land had to catch a wire. If they missed all the wires, they would either be caught in a barrier or worse, crash into aircraft parked forward on the flight deck – not a good result! After the Korean War and the introduction of jets, which were much faster than propeller airplanes, the British came up with the idea of “angling” the flight deck by about 9 degrees to the left of the ship’s centerline, so that if an airplane missed a landing wire, the pilot could add power, take off again and make another try. 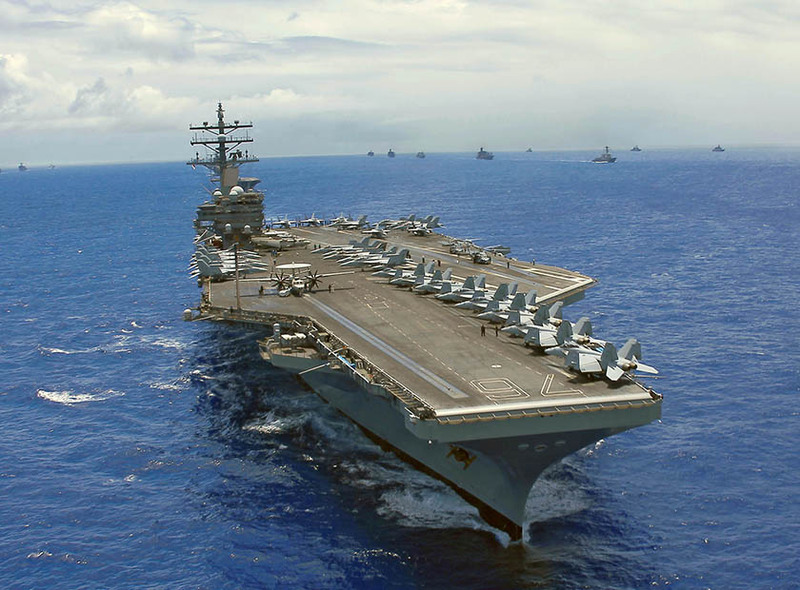 Aircraft carriers can hold up to 90 or more aircraft and 5,000 sailors and air wing personnel. Some of these thousands of people (ships company) may be “permanently” stationed on the carrier for 2-3 years, and some are part of air wing detachments that live on board for 6-month periods, depending on their deployment objectives. The crew work 10-15 hours a day and sleep in tight quarters; but after such a long day, they’re exhausted enough to sleep just about anywhere! Their exhaustion is the result of non-stop efforts to operate, repair and maintain the ship and aircraft at sea during flight and/or combat operations. In addition to long days, tight quarters and strenuous work activities, another element of aircraft carrier life is non-verbal communication. Because the flight decks are a dangerous and noisy place, crew members have to use a system of clothing colors and hand signals to communicate. Depending on the function or task performed, each crew member is assigned a specific color jersey to wear while on deck. Hand signals are used to relay important information. This intricate system has proven to be effective given the hazardous environment of the flight deck. During flight operations, carriers employ an optical landing system that provides the pilot with accurate visual altitude/glide-slope information that assists him/her to land safely. The optical landing system consists of a horizontal set of blue datum lights intersected in the middle by a vertical stack of Fresnel lenses. These lenses beam a 3.5 degree slope aft of the ship, so when pilots approach the ship and intercept the beam at the correct altitude, an orange ball appears in the center of the lenses. If the ball appears to be going high (above the blue datum lights), the pilot reduces the power to descend and center the ball. If the ball appears low (below the blue datum lights), the pilot adds power to climb and center the ball; if the ball goes really low, the Landing Signal Officer (LSO) may give an urgent warning to the pilot to go around to prevent the jet from crashing into the stern of the ship! Want a 3D experience of life aboard an aircraft carrier? Watch City at Sea: Aircraft Carrier in our 3D movie theater!